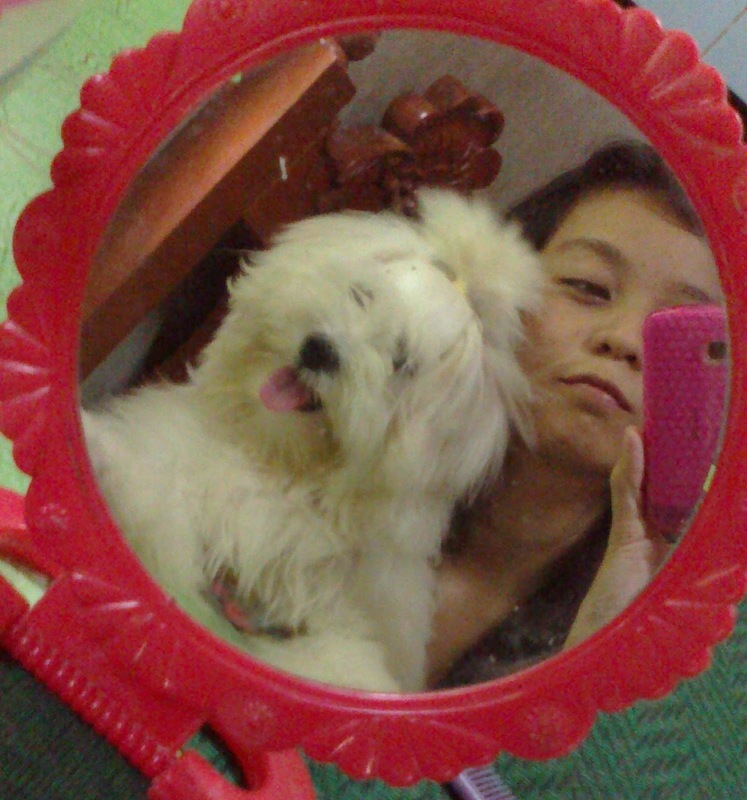 Home » personal » pets » Shihtzu » Yuki » Till We Meet Again, Yuki. 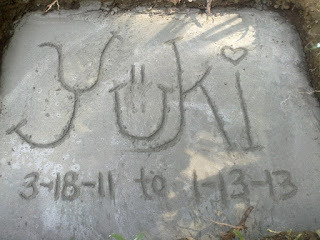 Till We Meet Again, Yuki. When I told mom about what happened, that's when the tears came out. I sobbed. Endlessly. Kuya made you a nice sleeping place in our garden. That's where your earthly body is now. You know how much mom love that garden. I guess you'll never run out of flowers, ey? Do you like what I did here, Yuki? All day, I've been wiping my tears. Who would greet me now when I come home from work? Who would bark at the lizards, mosquitoes, spiders or whatever's on the wall now that you're already in heaven? Who would wake me up in the morning when it's late and I'm still asleep? Sino na kasabay ko kumain pag walang tao sa bahay? Sino na ipaghahanda ko ng pagkain sa umaga kahit male-late na ko sa work? :'c These questions are all too painful to answer. I know you are happy now, Yuki... I wanted to let go of this selfishness I feel. You are now in a better place. You will continue looking out for me, won't you? You will still be my protector. God and you. Tell Him that I will soon be okay with His decision to take you away. He has reasons, I know. I just need time, a lot of it I think, to get over this sadness. I think He's teaching me to be stronger... He knows better than I do after all. Tomorrow, and for a million, ten million, billion other tomorrows that may come (if I'm still alive), I'll keep you in my heart, Yuki---my superdog. P.S. Don't chew on God's furniture, okay? And, remember, I LOVE YOU. No one can take it. Sorry to read the sad news. It really hurts to say goodbye to somebody we love especially if parts of our family. Condolence! It's really sad when we lose our pets but your pets will be just be there as your guardian and will always appreciate how you took care of Yuki. Condolence for the lost of your Pet, Im sure Yuki is now happy wherever she is. I salute you for giving your pet a honorable burial. You deserve to own a lot of pets because you have a nurturing heart. May puso ako para sa mga so. Halos maiyak na ako sa story ng dog mo. He was a brave dog and base on your account, talaga very thoughful and loyal siya. Hinahanda ko na rin ang sarili ko sa time nsa my dear Sarsi will leave me. He is 12 years old na. ZOmg, I remember my dad as well crying and lost his apetite eating when our dog died ! haist.. nkakalungkot RIP po. Awww... our pets really become somewhat like the extension of ourselves especially when we've loved them for years. It's hard to say good bye to them. You have such a cute dog, I like the dog's fur; white, clean and healthy looking. I'm sorry to know about your lost. I remember my old dog when I was only 5 years old because of this post. I'm sharing the same feeling when my old buddy passed away. 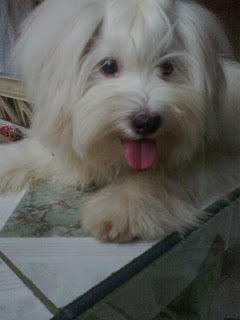 I still thank God for having my pet the past 3 years. I had great memories with him and I always remember. Sis, ;-( naiyak tuloy ako ulit. It just always hard noh?